These cupcakes are perfect for the Oreo cookie lover. They start out with half an Oreo in the bottom of the liner. Add more chopped cookies to the batter and garnish with yet another Oreo. 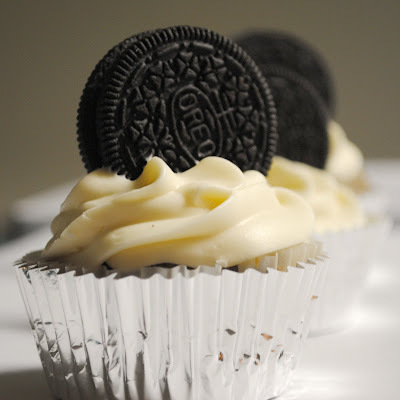 Topped with a cream cheese frosting, these cupcakes are cookies and cream heaven. 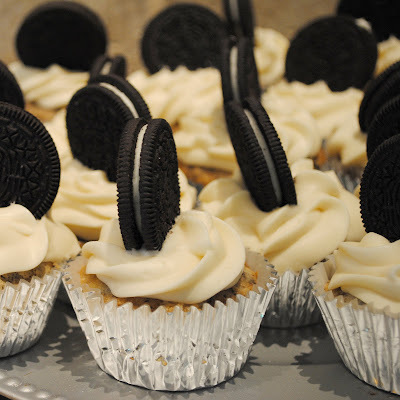 The most time consuming part of these cupcakes is separating the Oreo halves for the bottoms of the cupcakes. Because I'm a little too Type A, I wanted to make sure all the cupcakes had an Oreo half complete with the cream filling. So I ended up splitting about 50% more Oreos than I would have needed. No big deal though, just add the extras, along with the other halves into the food processor to add to the cupcake batter. You can crush the Oreos a few different ways, I throw mine in the food processor and pulse just a few times so I get a nice mix of small and large pieces. You definitely want the cookies on the chunky side so that the pieces show up in the batter and you don't just end up with gray cupcakes. If you don't want to mess with the food processor, you can add the cookies to a large Ziploc and crush with a rolling pin or just chop them up with a knife. Preheat oven to 350 degrees. Line 24 cupcake cups with liners. Separate 24 Oreos, leaving cream filling on one half. Place cream side up in the bottom of each liner. Add the other halves and remaining cookies to food processor and pulse a couple times to create large chunks. Set aside Oreo chunks. Combine butter and sugar in a mixing bowl and beat on medium speed for 2-3 minutes until light and fluffy. Add egg whites, one at a time, mixing well after each addition. Sift together flour, baking powder and salt in a small bowl. Add milk and vanilla to a large measuring cup and stir together. Add 1/3 of the flour mixture to the butter mixture and mix on low speed just until incorporated. Follow with 1/2 the milk mixture, mix on low and continue alternating additions, ending with flour mixture. Stir in Oreo chunks. Scoop batter into prepared liners, filling 2/3 of the way full. Bake for 18-20 minutes until tops are golden and a toothpick inserted in the center comes out clean. Cool in the pan about five minutes and transfer to a wire rack to cool completely. Beat butter and cream cheese on medium speed until smooth and creamy, about 2 minutes. Add vanilla and cream and beat until incorporated. Add powdered sugar, one cup at a time, beating on low speed until incorporated. Increase speed to medium high and whip for 30 seconds to a minute. Fill a piping bag and pipe onto cupcakes as desired. Garnish with an additional Oreo or Oreo halve. These look delicious! Could you just put a whole Oreo on the bottom??? These look amazing!! 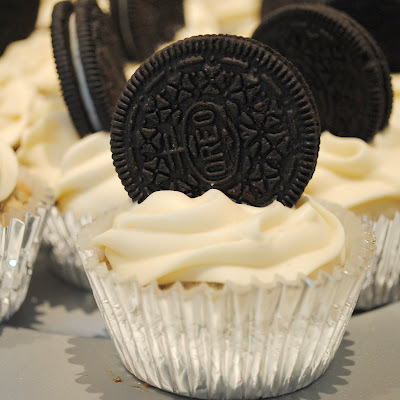 I haven't tried oreo cupcakes but oreos are my fav!! YUM!! @Tfan - you probably could - it might just be a little crunchy still. I found a few similar recipes that all used half an Oreo so I'm not sure. I made these as soon as I saw them on here and they were delicious. I had a little problem with the oreo on the bottom, it stuck to the wrapper. Thanks for sharing the recipe!!! Hello, do the cupcakes need to be refrigerated? Or how long can they stay out at room temperature? I'm always confused with cream cheese frostings and everyone says to not put cupcakes in the fridge, as they'll dry out? @Trusty Gal - sorry they stuck - I didn't have that problem so I'm not sure what happened. I'm assuming you put them in cream side up. @RA - you should refrigerate them if its going to be more than a couple of hours at room temperature.